Politician Yashwant Sinha who recently quit the BJP seems to have decided to join the “expert punditry panel” which has taken it upon itself to vehemently condemn the BJP for trying to form the government in Karnataka, despite it being the largest party by a margin. As seen above, Sinha expressed his happiness at leaving the BJP, which he claims was trying to subvert democracy in the Southern state, before alleging that it (BJP) would do the same if it failed to gain a majority during the 2019 Lok Sabha polls. As claimed above, Sinha who is now expressing his deep reservations over BJP allegedly indulging in “horse trading” to form the government in Karnataka, had himself been part of erstwhile Prime Minister Chandra Sekhar’s dissident group in 1990, which broke away from VP Singh led Janta Dal government to gain power at the centre – with the outside support of Rajiv Gandhi’s Congress (I) MPs. Going by an India Today report from 1990, Chandra Sekhar managed to form the government in the centre with the help of 211 Congress (I) MPs. His companion as per the report was 60 Janata Dal MPs, the group which styled itself as, Janta Dal (Socialist). The said India Today report describes this political manoeuvre as, “Sabotage, backstabbing, horsetrading reminiscent of the fall of the Janata government in 1979 were once again on vulgar display”. New York Times, which also reported about dissidents splitting VP Singh’s party claimed how the PM was dealt a crippling blow by this act, which was spearheaded by Chandra Sekhar. 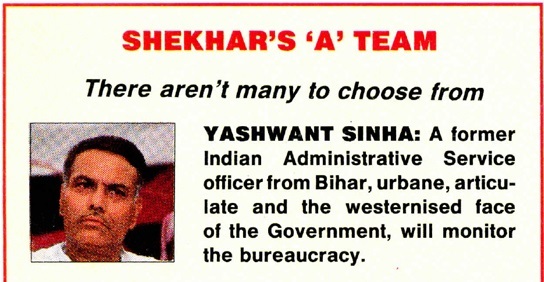 The involvement of Yashwant Sinha is narrated in a Britannica biography, which describes him as joining Chandra Sekhar’s Janta Dal (Socialist) in 1990 after the Janta Dal split. It further points how he then “changed his loyalties” to the BJP a few years later. Sinha was certainly rewarded back then for his “decision” with the Finance Ministry from 1990 till the government fell. With Sinha himself being involved in “glaring subversion of democracy”, it raises the question as to how “deserving” is he to attack others for allegedly trying to do something similar – at least in his eyes.